If she follows God's call will love pass her by? No Distance Too Far is the new Romantic Fiction by award winning author Lauraine Snelling. No Distance Too Far is the story of Astrid Bjorklund who wants to use her medical training to serve God. Still smarting from a misunderstanding with Joshua Landsverk, the young man she thought she loved, she heads south to a missionary training school, hoping to eventually use her skills in some remote outpost in Africa. When Astrid is called home to help her family in a medical emergency, a door of opportunity opens up for her. Perhaps the mission God intends for her is not exactly what she had imagined. Investing all of her energy into this new venture, she won't let herself be discouraged by some disapproving townsfolk in Blessing. But when a certain young man also expresses opposition, will she be caught off guard? 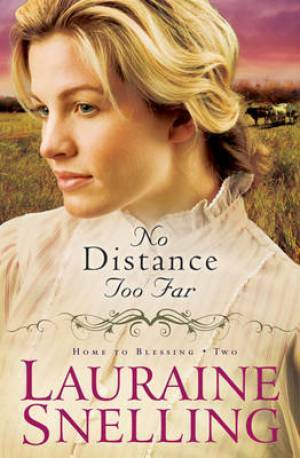 In No Distance Too Far, Lauraine Snelling is the second book in the Home To Blessing series. No Distance Too Far by Lauraine Snelling was published by Bethany House in July 2010 and is our 21355th best seller. The ISBN for No Distance Too Far is 9780764206108. Be the first to review No Distance Too Far! Got a question? No problem! Just click here to ask us about No Distance Too Far.